SBA Yearbooks are for Sale! This will be a soft cover, professionally bounded 70+ page yearbook that will include all students, faculty, staff and student organizations as well as your favorite events of this past year! Do not miss the opportunity to have all of the memories from this past year in one place. SBA has composed this yearbook, but it contains much more than simply SBA events. We have tried to include and capture all aspects of student life this past year. This Yearbook is $20 for 2018-2019 SBA Members and $25 for non-SBA Members. If you have any questions please contact Alyssa Iglesias, Lane Christopher or myself. This entry was posted in Uncategorized on April 16, 2019 by Sam Sanders. 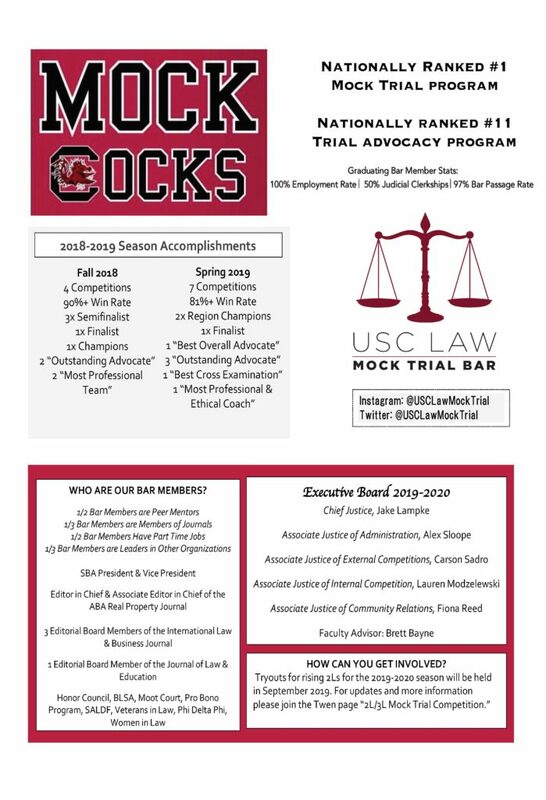 Are you interested in being on the Mock Trial Bar? How can you get involved? Tryouts for rising 2Ls for the 2019-2020 season will be held in September 2019. For updates and more information please join the Twen page “2L/3L Mock Trial Competition.” If you have any questions please contact Jake Lampke at jlampke@email.sc.edu! This entry was posted in Mock Trial on April 15, 2019 by Sam Sanders. 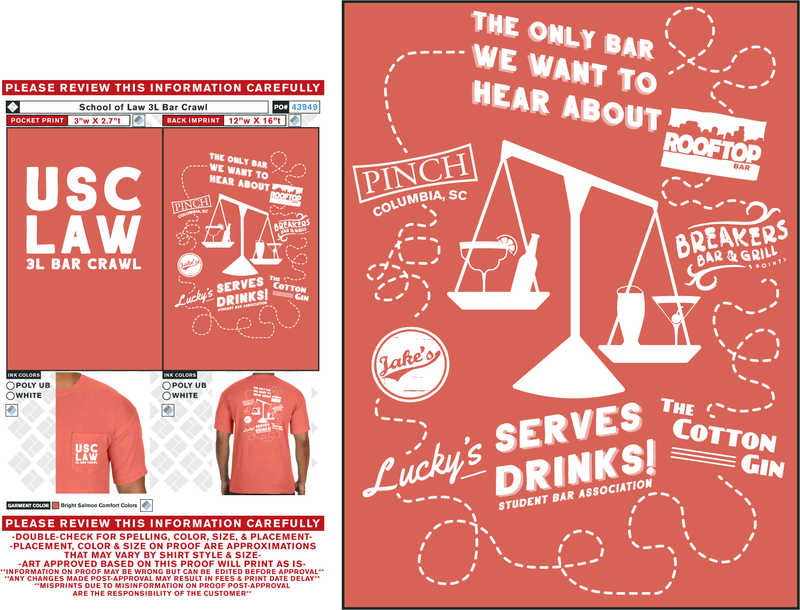 SBA will be Hosting the 3L Bar Crawl on Tuesday May 7th. This is a free event SBA hosts for all 3Ls. This is an event exclusively for 3Ls & their dates; however, if 1Ls and 2Ls would like to participate please contact Jacqueline Donner to sign up to be a referee. The 3L Bar Crawl is hosted at six of your favorite Five Points establishments and includes competitive games and team building! To sign up please use the free signup below and register you and your teammates complete with their birthdates and email. All participants that sign up before May 1st will receive a free koozie. SBA will not be providing drinks, but will be arranging for drink specials at each bar for those that would like beverages. If you do not have a team or only have a few teammates please sign up and we may put a few small groups together or if you have 2 teams of 10 that would like to stay together please just let Sam Sanders know! If you have any other questions please contact Sam Sanders, Jacqueline Donner or Lane Christopher. This entry was posted in Uncategorized on April 12, 2019 by Sam Sanders. Below please find the April 10, 2019 Election Results. 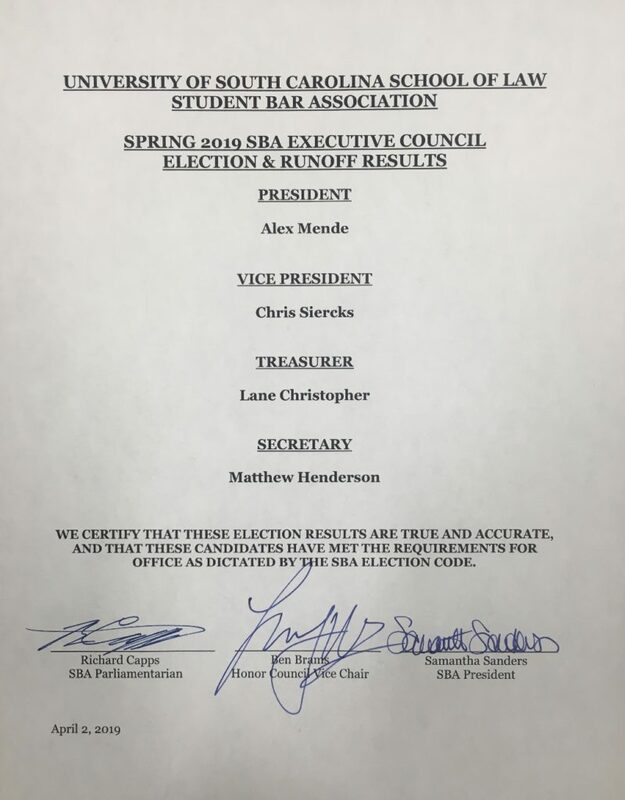 SBA would like to congratulate all the candidates and thank them for their hard work and determination to SBA the past few weeks! We are so proud of you and cannot wait to see all that you will accomplish for USC Law next year! This entry was posted in Uncategorized on April 11, 2019 by Sam Sanders. All are welcome to attend the SBA transition meeting that will be occurring on April 11th from 7:00pm-8:00pm. This entry was posted in Uncategorized on April 4, 2019 by Sam Sanders. SBA will be hosting its first Town Hall on April 10th at 12:30pm in room 136! This will be hosted by both the old and the new executive boards in a joint effort to gain student insight into their thoughts on SBA. The old executive board will be able to explain what they tried and what worked, but also what did not work from an SBA perspective. As well as let them know any barriers that might be unknown to the general student body that SBA encountered and suggestions on how to fix these barriers. The new executive board will be there to let the student body know the SBA priorities for the next year. Additionally, the main portion of the hour SBA hopes will be spent on student comments by the attendees asking questions and voicing their concerns or suggestions that they have. The SBA old and new executive boards will be there to respond to what they can and make sure any questions are addressed. 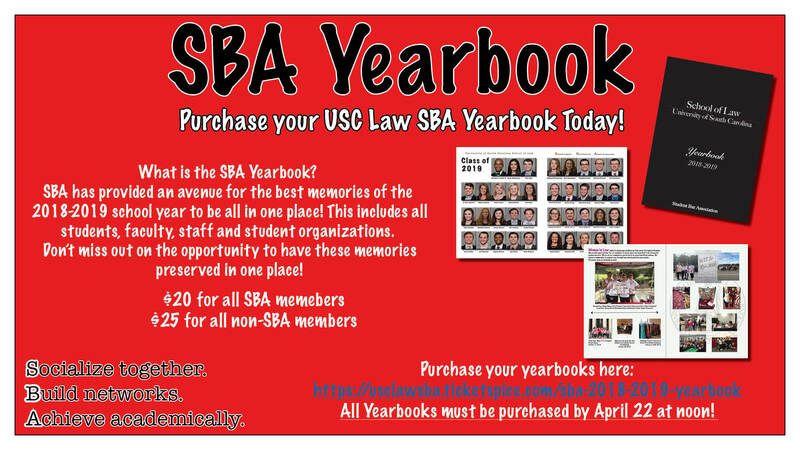 This is truly the students chance to offer any insight into what they would like to see changed at USC Law by SBA. We hope to see you on Wednesday at 12:30 in room 136! Jake Brice: Hi everyone! My name is Jake Brice and I am running to be one of your Honor Council representatives. I was fortunate to be elected to represent you all last year and am looking to represent everyone again with more experience and knowledge under my belt. As I have always contended, “The best violation is one that never occurs,” and that starts with us on the Honor Council. If we can effectively communicate and demonstrate the Honor Code to all, then we can prevent many violations from ever occurring. If elected to the Honor Council, I will try to be an effective communicator and source for all your questions and remarks so that no one is left confused or unclear as to any matters regarding anything that the Honor Council does and how it operates. 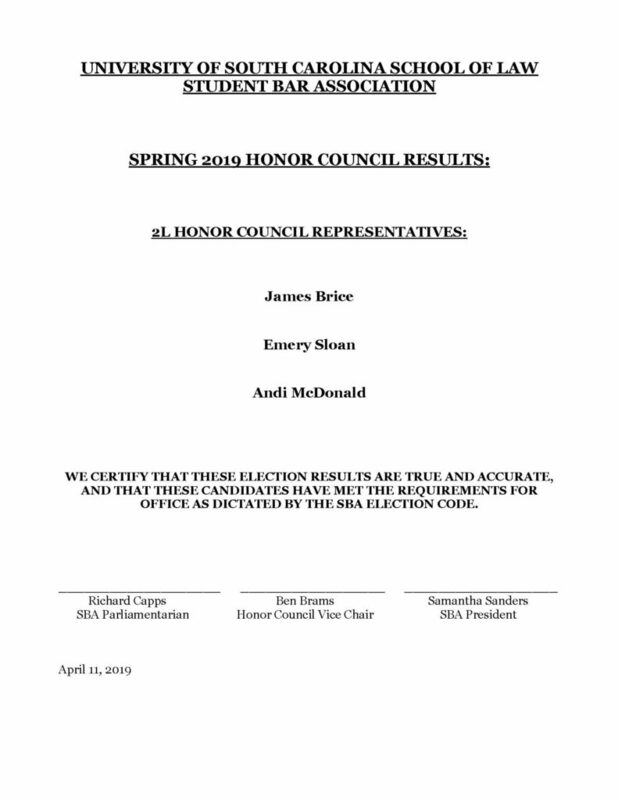 I would love the opportunity to represent you all again as a member of the Honor Council. However, regardless of who you vote for, just make sure that you do vote! Andi McDonald:Hi all! My name is Andi McDonald and I am running to serve as Honor Council Representative. In my first year on the Honor Council, I had the opportunity to learn more about the Honor Code and assist my classmates in understanding its requirements. In addition, I served on boards of multiple student organizations as an undergrad, and my role as Vice President of a Film Society closely resembled the responsibilities I would hold as your Honor Council Representative: I learned the organization’s constitution, helped students follow its rules on individual projects and multi-organization films, and enforced the rules when necessary. On a personal level, I strive to treat everyone with kindness and understanding. Although disciplinary hearings are never fun, I will be sensitive to both sides while still appreciating the academic integrity that the Honor Code seeks to protect. I would be honored to continue upholding the values and standards of the University of South Carolina School of Law as your Honor Council Representative. Emory Sloan: My name is Emery Sloan and I am running again to represent the 2L class on SBA’s Honor Council. For those of you I haven’t met yet, allow me to introduce myself. I was born and raised in Rock Hill, SC and graduated from Furman University with a triple major in philosophy, Asian studies, and political science. I then went to American University in DC for my Master’s degree in philosophy and social policy. I interned at the Embassy of Israel while in DC and, shortly before coming back to SC, worked as an immigration paralegal in New Jersey. 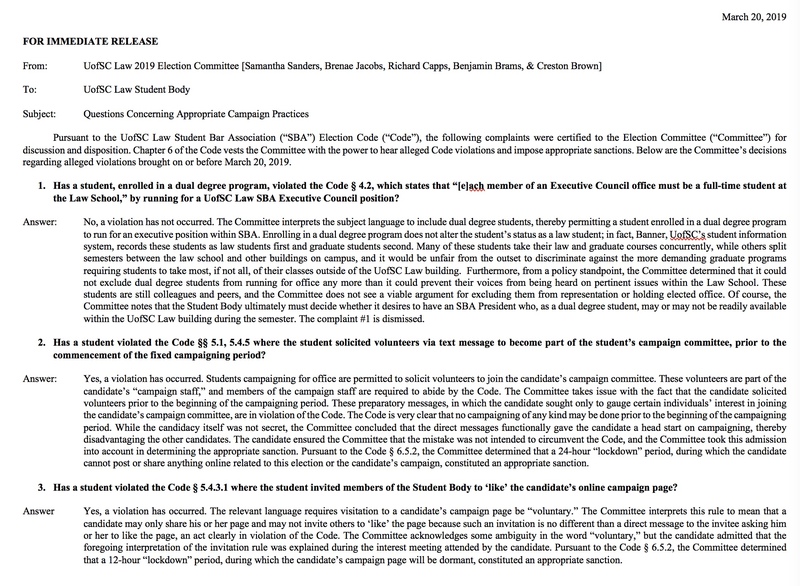 I have thoroughly enjoyed representing the 1L class on the Honor Council this year, and would like to offer two reasons (though I have many more) for why I am running again: First, I have significant experience. I was on the honor council as a boarding student at my high school, and also when I was a graduate student at American. That said, I was also brought in to the honor council (and thankfully found not guilty!) for something I did not do when I was at Furman. As someone who has been on both sides of the honor council, I understand the importance of having a student representative who is objective and will not assume guilt just because a hearing is taking place. I have learned through my past involvement how to be both mindful and fair while representing my peers and considering their conduct. Perhaps most importantly, having already served at USC, I know what the job entails and I am prepared to assume the responsibilities that accompany it. Second, while I’m not a fan of self-promotion, I should also add that I am a very motivated and driven person. I want to be involved and put in the work necessary to make a positive impact on our community. I also like to challenge myself and am excited to continue taking on the challenges that come with being a member of the Honor Council. Thank you all for your consideration and, hopefully, for your vote! Kirkland Dixon: My name is Kirkland Dickson and I am running to be re-elected as an Honor Council representative. I served on the Honor Council as a 1L and 2L representative and as the Secretary. I hope to continue to serve as one of the 3L representatives. During my time as an undergrad at Wofford College I was involved in various organizations and the school at large in roles similar to this position on the Honor Council. The time I spent on Wofford’s Honor Council put to use my skills of impartiality and dealing with sensitive, confidential information. It was through these trials as defender, prosecutor, or jury member that I was able to understand how an honor council serves the student body that it is representing. I also was part of deciding if and how to implement proposed changes to the Honor Code. 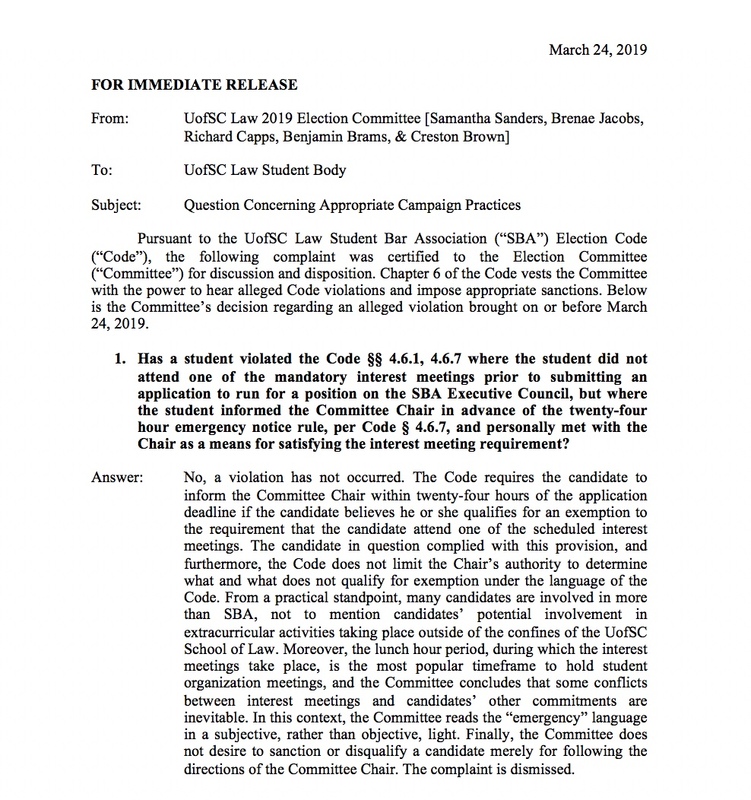 If elected to represent the 3L class on the Honor Council I will work to the best of my abilities to ensure that access to the Honor Code is simple, the language of the code is transparent and easy to understand, and the opinions of the 3L class are heard when proposing potential changes. Thank you for your consideration and remember to vote on TWEN! John E. Gardner – Obedience to lawful authority is the foundation of manly character” -Robert E. Lee. Virtue is often nebulous and hard to gain practical import. Lee presents a simple, yet precise account of what I believe to be the chief concern regarding maintenance of order within society. In Law School our society is narrow, but the Honor Council preserves the lawful authority which governs us. My experience this past year serving you on the Honor Council has affirmed my convictions to offer my efforts in support of this authority. As such, I pray for your consideration and aid in being re-elected as a 3L representative of the Honor Council. Below please find the April 2, 2019 Election Runoff Results. SBA would like to congratulate all the candidates and thank them for their hard work and determination to SBA the past few weeks! We are so proud of you and cannot wait to see all that you will accomplish for USC Law next year! This entry was posted in Uncategorized on April 2, 2019 by Sam Sanders. The SBA Legislative Election will occur on Wednesday, April 10th from 9:00am-7:00pm on Twen. Below please find the candidates and their statements. Andi Borhanian – Hey everyone! My name is Andi Borhanian and I am running to be a SBA 2L Legislative Representative. I am SC born and raised and the vast majority of my family has attended the University of South Carolina. I love this school and its community so much and want to do everything that I can to make sure that every student is well represented and has the wonderful experience that I had here in undergrad and have continued to have in law school. As a minority, diversity and inclusion is so important to me and I will do my best as a SBA Representative to make sure that every single student has the opportunity to have their voice heard in decisions that affect the law school and the experience that they will have during their time here. If you see me in the commons or around school please feel free to stop and ask me any questions or voice any concerns you have regarding the law school. 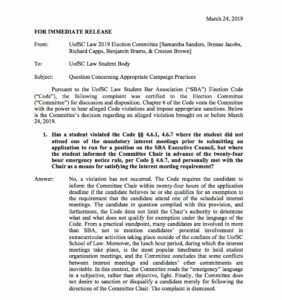 Representing the 2L class would be an honor and a privilege and I would be humbled to receive your support and vote in the upcoming legislative election. Grace Brown – My name is Grace Brown, and I am a rising 2L in section 3 here at USC Law. I am originally from Maryville, TN and attended the University of Tennessee prior to law school– Go Vols! I am so excited to pursue the opportunity to be a Legislative Representative for SBA. Being a member of SBA has been a formative part of my law school experience thus far, and I feel compelled to do my part to ensure that it continues to do the same for others. I look forward to meeting and chatting with you all soon! Hugh Gallagher – My name is Hugh Gallagher. I am running to be a 2L Legislative Representative on SBA. I am originally from Cincinnati, Ohio (never going back, ever!) and attended the University of Tennessee. While at the University of Tennessee, I was involved in Student Government, participated in Peer Mentoring, volunteered at the Boys and Girls Club of the Tennessee Valley, and was the president of my fraternity. These experiences taught me the significance of accountability, inclusiveness, and follow-through. My goal is to promote student pride and involvement in events at the Law School and off-campus. I believe the University of South Carolina School of Law camaraderie and support are an intrinsic part of being a successful lawyer. It would be my honor to receive your vote in the SBA Legislative Election. Natalie Maier Hi! My name is Natalie Maier, and I am running to represent my peers as a 3L Legislative Representative. I believe that I can add a unique perspective to SBA because of my involvement in smaller organizations at school. I am the Justice for the Phi Alpha Delta chapter at USC Law. Because of this, I’d love to help other small organizations get turn out at events, because I know just how challenging they can be to plan.Additionally, I’m a member of the Pro Bono Board, and am in the Children’s Law Concentration. Through Pro Bono, I am a Guardian ad Litem with CASA, and a visitor for the the Probate Court. My dream job would allow me to advocate for issues primarily impacting women and/or children. So, one of my goals is to get more students involved with Pro Bono activities. I would love to organize joint events between SBA and Pro Bono. Hopefully, these events will facilitate networking and professional development.Finally, I would love to make mental health resources common knowledge among students. Law school can be very stressful, and I want to organize events to reduce that stress. I like to think outside of the box- examples include organizing group workout classes at local gyms, or having speakers in the financial services industry teach graduating students some budgeting basics (like how to pay loans and also save some money). Thanks for reading and considering me as a candidate! Macey Webb – My name is Macey Webb. I am currently a 2L hoping to be one of your next 3L Legislative Representatives on SBA. I am currently a 2L representative on SBA and hope to continue to be the voice of my fellow 1L, 2L, and 3L friends and bring their concerns that they have before SBA as well as bring any ideas to the table that they recommend to me in order to better our law school. I am currently a research assistant for Professor Fox, a peer mentor, and also the Managing Editor on the Journal of Law and Education. I attended undergrad here at USC and was a member of the University of South Carolina Softball Team. My passion for the university runs deep and my goal is to help everyone else become passionate about the great school that we all have the opportunity to attend. 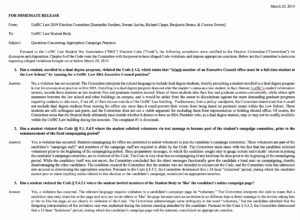 My overall goal as your SBA 3L Legislative Representative is to help implement programs that will help encourage student involvement and engagement in activities at the Law School and outside of Law School. My goal will be to help us all grow as a law community together. Though the help of other SBA members, one main goal will be to continue to increase alumni networking opportunities for current students and get the alumni of the law school more connected with current law students. 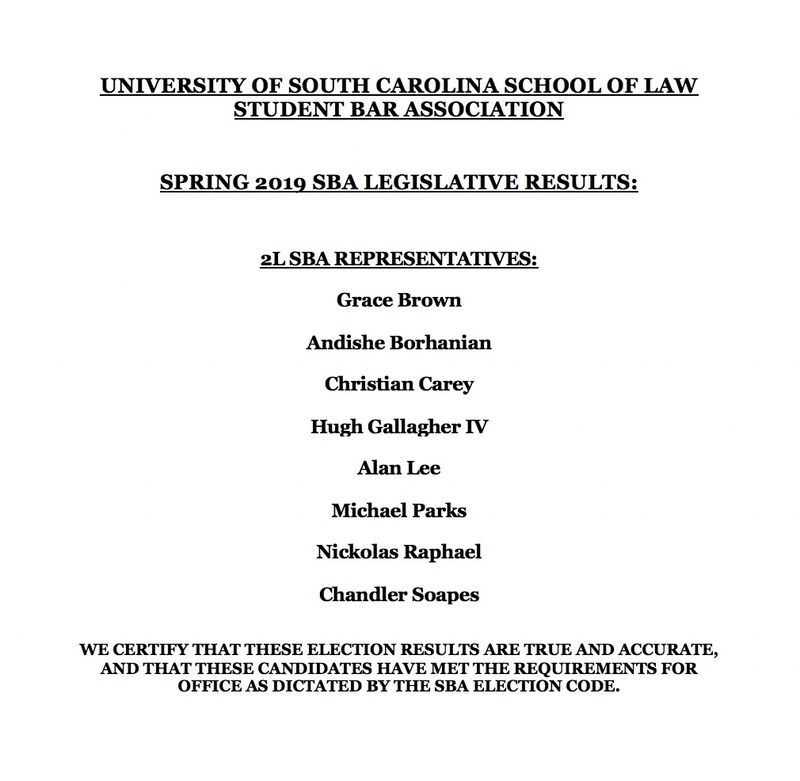 For these reasons and so many more is why I hope to be the next 3L SBA Legislative Representative. This entry was posted in Uncategorized on April 1, 2019 by Sam Sanders. 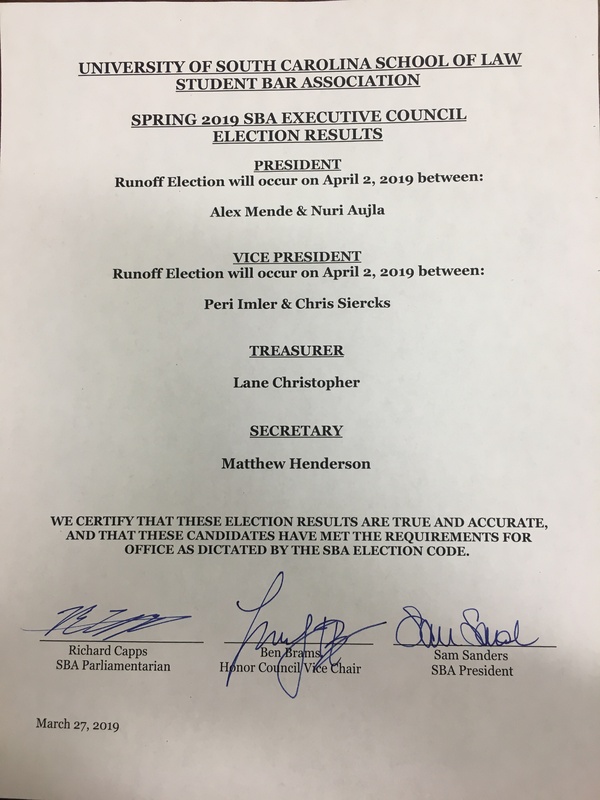 The results of the 2019-2020 SBA Executive Board Elections are below. If you have any questions please do not hesitate to contact the Election Committee. We look forward to Run-off, SBA Legislative and Honor Council Campaigning beginning now on March 28th at 9:00am with voting occurring on April 2nd beginning at 9:00am. Thank you to all the candidates for an amazing week and we can’t wait to see what leadership positions you will take at USC Law. If you have any questions please contact any member of the election committee. Sam Sanders, Chair; Richard Capps, SBA Parliamentarian; Benjamin Brams. Honor Council Vice Chair; Brenae Jacobs, SBA Member; Creston Brown, Honor Council Member. This entry was posted in Uncategorized on March 26, 2019 by Sam Sanders. 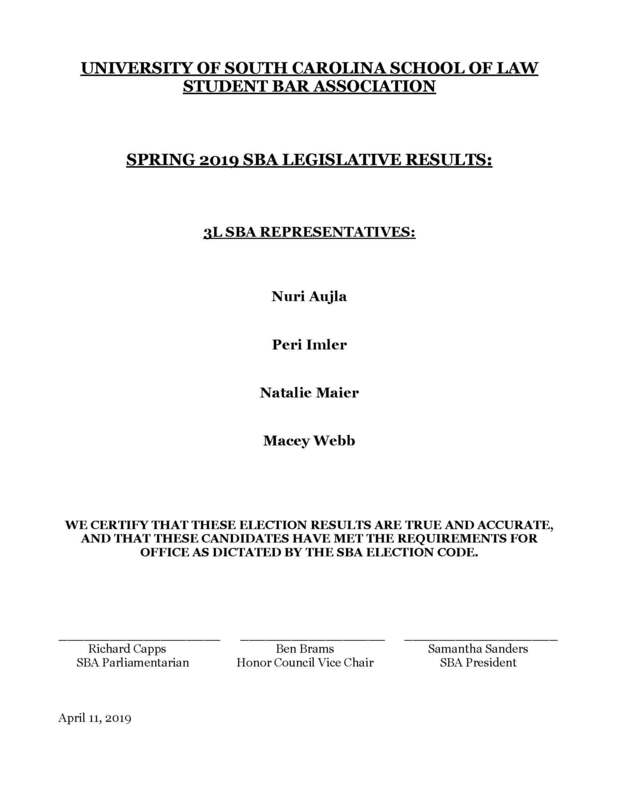 Below are the candidates for the SBA Executive Election and their Facebook Pages where you can learn more about them. Remember voting takes place on Twen from 9:00am-7:00pm. This year SBA has tried to be as transparent as possible. We have been asked for this information, therefore, we wanted make public knowledge both the SBA attendance from the meeting this year and the service hour sheet from this past year. We think it is important to highlight the students that have given so much of their time this past year to this organization. If you have any questions please do not hesitate to contact Sam Sanders at ss26@email.sc.edu. Volunteer at the Big Event! SBA is participating in a University wide initiative called The Big Event on March 30th at 9:00am – 2:00pm! We encourage you to sign up to volunteer with SBA by the deadline on March 28th. If you have any questions please feel free to reach out to any SBA Representative or contact the big event executive team at jaallen@email.sc.edu or abbyej@email.sc.edu. We thank you for making it possible to help SBA help make a difference in our USC community.